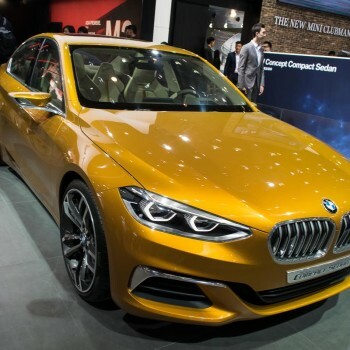 Six month ago BMW unveiled the Concept Compact Sedan at the Guangzhou Auto Show, previewing an upcoming BMW 1-Series sedan. 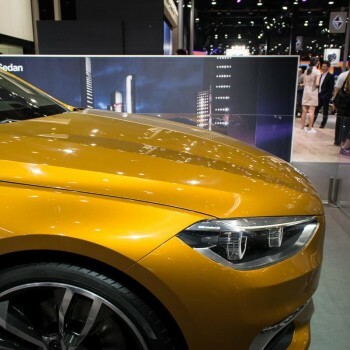 Now the concept shows up at the 2016 Beijing Motor Show again – with new color. The car still looks outstanding, but chances are not good, to see it outside of China. 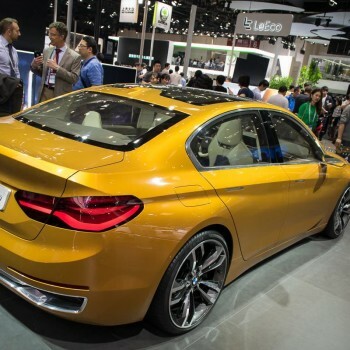 In Guangzhou the concept showed up with the color named “Liquid Metal Bronze“, in Beijing now its “Sunglow metallic”, BMW MOTOR SHOW BLOG was told by a BMW representative. 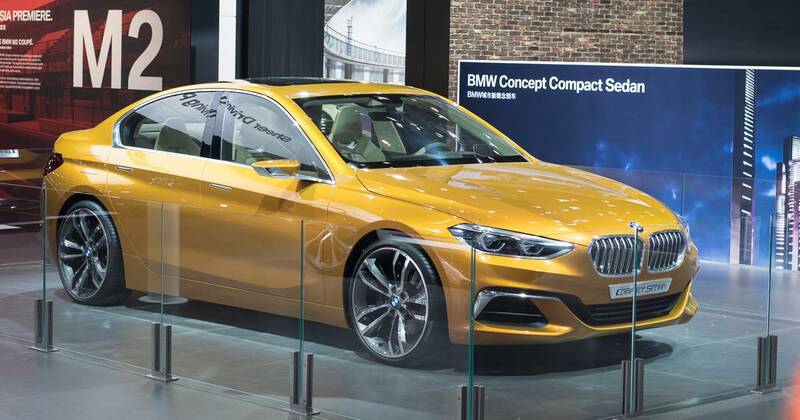 The Concept shows a sedan-version of the BMW 1 Series, especially developed for the Chinese car market. 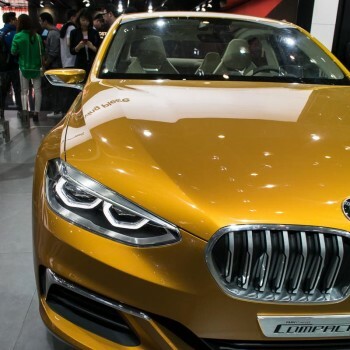 In China they just love premium sedans, so BMW reacts on this demand by developing a compact sedan based in its front-wheel-drive plattform UKL; the very same the BMW X1 and BMW 2 Series Tourer-cars are based on. The reason for using this plattform is just simple: cars based on that plattform were already build in China, by BMW Brilliance’s Tiexi plant in Shenyang. 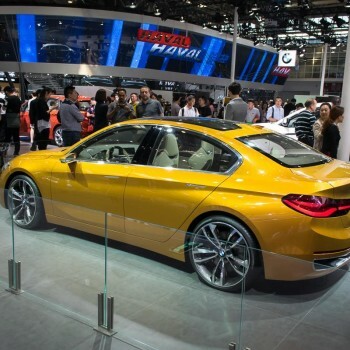 It is expected, BMW will inteoduce the new China-bound Series with a 2016 model year. But until now, there’s no official word about that yet . 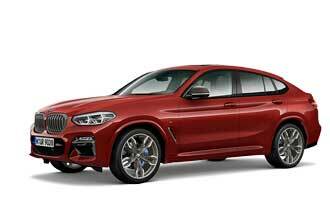 Also not on engines, but you can be sure it will be the same as the new BMW X1 long-wheelbase. So there should be three-cylinder petrol engines with somef 100 kW/136 hp as well as some four-cylinder petrol engine with a peak output from 141 kW/192 hp up to 170 kW/231 hp … So ething like that. 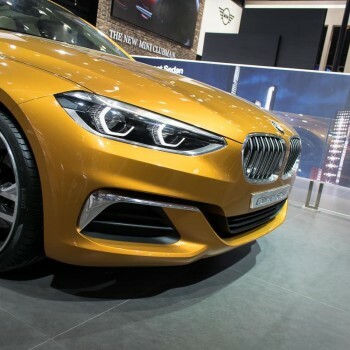 The BMW 1 Series Sedan will be launched in China, and maybe it will stay here … But who knows, if the new international version of the BMW 1 Series gets FWD ,aybe we’ll see an international version of the sedan, too … What do you think about?